This sauce is so amazingly good! I would love to take credit for it but it's an only slightly adapted version from Heidi's blog, which I love! Please go to her original version here for the full recipe. I'll still post it here as I've provided weights and made a couple changes. 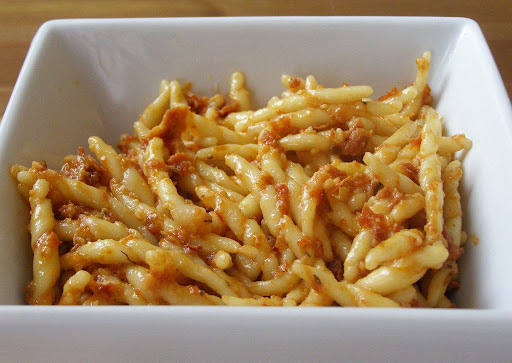 The obvious carrier for this sauce is pasta but it would equally be good as a sandwich spread, in wraps, rice salads, quesadillas etc.... it's very versatile. 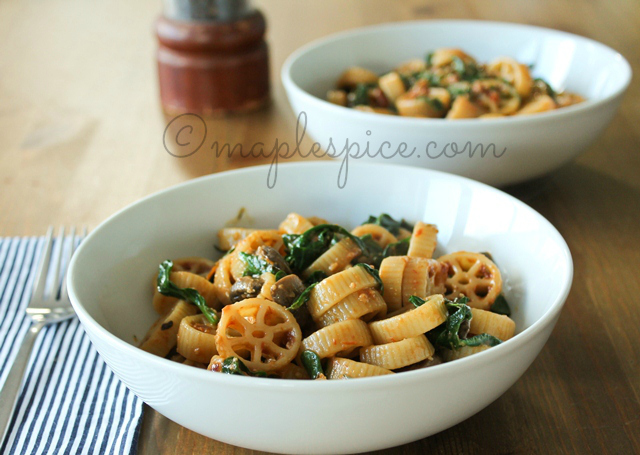 The pasta I've used here is the new vegan fresh pasta available at Waitrose. Many thanks to Steven from Lustrous Musings who tweeted about these! I have seriously missed fresh pasta and although I do make my own now and again, love the convenience of these. Yay for fresh vegan pasta!!! 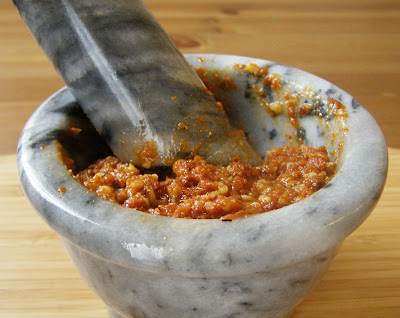 Add the sun dried tomatoes, garlic, chilli flakes, olive oil, thyme and salt to a food processor until fine and crumbly. Add the pine nuts and process until fine and crumbly. NOTE - my food processor is crap at coping with small quantities. I process the sun dried tomatoes in there but grind the garlic and pine nuts in a mortar and pestle, otherwise they just whirl around underneath the blades and never get processed. I then add everything else to the M&P and process that way. It should look like this in texture. Now simply cook your pasta in salted water, drain - reserving some of the cooking water, return to the pot and toss with the sauce. Add some of the reserved water to make it more saucy. Season with salt and pepper and if you have it, finely grate some extra mature cheddar cheezly on top. This pesto also works beautifully as a sandwich spread. This sandwich in particular is stunning! Get a grill pan nice and hot. 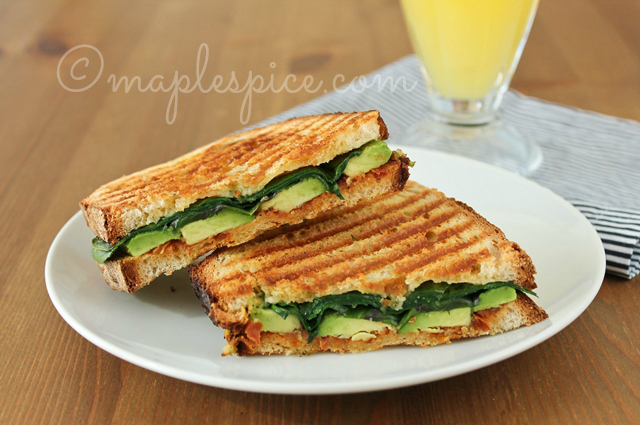 Spread one slice of the bread with the pesto then top with the avocado, a tiny sprinkle of smoked sea salt and a few grinds of black pepper, basil leaves and a good handful of baby spinach. Sandwich together then spread the top of the sandwich with the butter. Place butter side down onto the hot grill pan and grill until golden brown. Spread the top of the sandwich with butter and flip over and fry until golden brown. 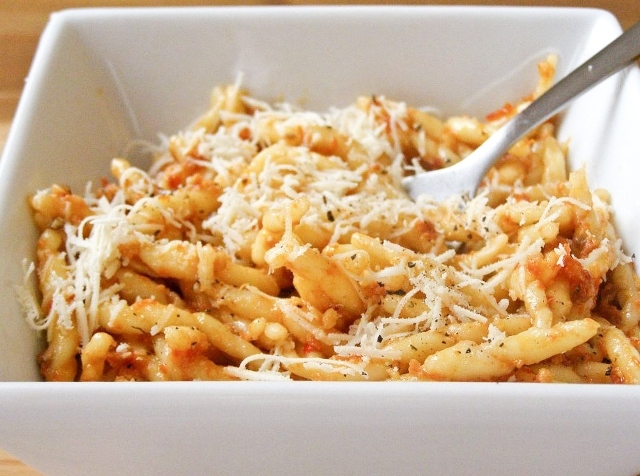 This looks delicious, and so simple to make too. This looks delicious! I love sun-dried tomatoes, especially the marrinated ones. Yummo! Sun dried tomatoes make such a good sauce. I've never made my own pesto, but I'm going to try now! This looks so tasty!